BBC documentary “The War on Britain’s Roads” is already at the centre of a heated discussion between two-wheeled road users and their four-wheeled counterparts, and it has also received some criticism from an MP. So, what's the fuss all about? The film shows footage captured by cyclists through their helmet-mounted cameras, in order to give the public a perspective and an understand of their point of view when cycling across British roads. The captured sequences are combined with interviews from bike-riders, drivers, and also from people affected by accidents caused by irresponsible behaviour. ”The War on Britain’s Roads” describes in very dramatic tones how the coexistence between cyclists and motorists is becoming more and more tense, with both groups battling to share the same overcrowded space. We know the documentary has been done with the best intentions, but said that, we find its unfolding a little too dramatic. It certainly gives a unique insight on road conflicts, after all there are thirty four million vehicles and thirteen million bikes trying to share the same roads, but calling it a battle, it sounds a bit too much. The footage provides visual details of minor incidents, but more than anything, it focuses on stories of near death experiences and fatal collisions. Ian Austin (the joint chairman of the Parliamentary Cycling Group and Labour MP for Dudley North) has spoken against the documentary, which he referred to as being “stupid, sensationalist, simplistic, irresponsible nonsense.” The MP said: "I cycle in London every day I'm there and have cycled all over Britain and whilst I do see drivers and cyclists do things they shouldn't, I have never seen some of the things they present as everyday occurrences." Obviously the film has picked extreme stories, possibly the most shocking ones. For instance, we have a cyclist who is attempting to regulate the roads himself, handing out his own 'tickets' and at one point, we can see the police chasing down at the same time both drivers and bike-users. But it must be said that probably the documentary is using some sort of shock-tactic in order to sensitise the public on the consequences of dangerous driving and cycling. 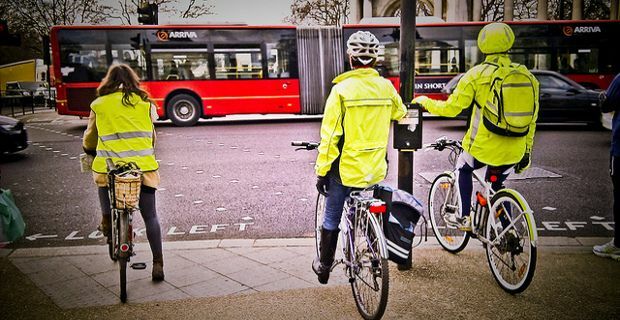 Cynthia, a mother who lost her cyclist daughter in a fatal collision with a lorry, tells about her efforts to improve cycle safety on our roads, and Alf, a London black cab driver, reveals how losing his grandson deeply changed his opinion about cyclists. Arguably the documentary sensationalises from time to time uncommon and even reckless behaviours, but if the footage could raise awareness of certain issues and prevent some tragic events to happen, we'd welcome the opportunity to watch it over and over again.